To make this sword, you'll need to know how to make a basic balloon twist and three balloon push through twist. To start, inflate the balloon and leave about five inches uninflated at its end. Make a one-inch basic balloon twist to form the tail. Make the first balloon twist to start the three balloon push through twist. Make the first twist about four inches long. Complete the three balloon push through twist to form the swan’s body. This picture shows the body of the swan with its tail after you’ve finished the three balloon push through. Take the remaining balloon and curl it up and hold it. You’ll have to experiment with how long to hold the balloon in place but you’ll find that the neck will eventually hold a curved shape. 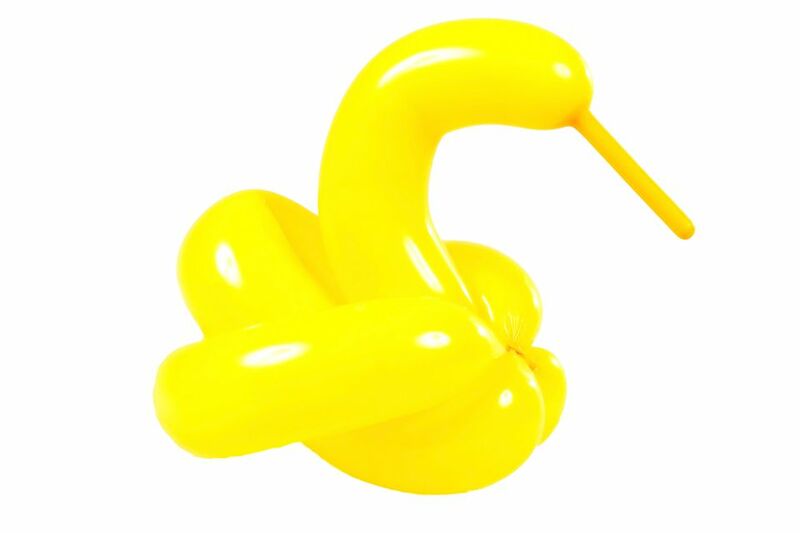 Your swan balloon animal is now complete!